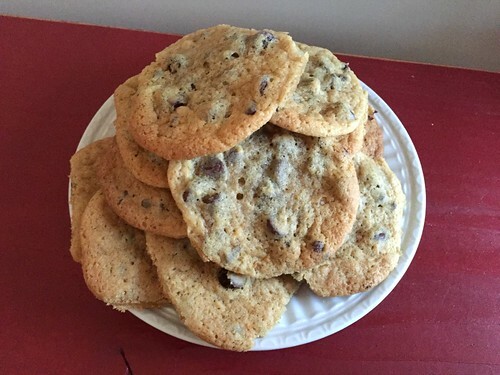 About 2 years ago, I got a fabulous chocolate chip cookie recipe from a neighbor friend. The cookies are amazing — perfectly crispy and chewy and delicious! At the time, I thought I was finally finished searching for that “perfect” chocolate chip cookie recipe as everyone in our family loved them. However, that recipe has peanut butter in it. Peanut butter is not a big deal for our family, but when Nora started school this past fall, I quickly realized that peanut butter is a big “no-no” pretty much everywhere else outside our home! She can’t bring anything with peanut butter… ever! Not even for her own lunch. 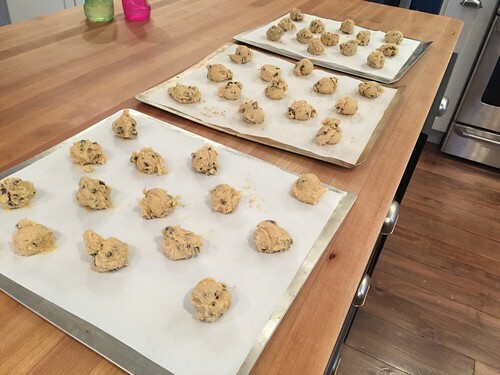 And since the 2 cookie recipes I make the most often are Monster Cookies and our favorite Chocolate Chip Peanut Butter Cookies — both of which have massive amounts of peanut butter in them, Nora gets lots of Oreo’s in her school lunches. I’ve tried making our favorite Chocolate Chip Peanut Butter Cookies with peanut-free “nut butter” alternatives — but in my opinion, it’s not even worth the calories to eat a cookie that tastes so inferior to the delicious treats we’ve grown to love. So, this past fall, I resumed my mission to find a “perfect” chocolate chip cookie recipe — this time, with no peanut butter! I scoured the internet, looked through various cookbooks, flipped through many Pinterest recipes, and tried different variations of multiple recipes in an effort to find a cookie that was crispy on the outside, chewy on the inside, not too fluffy, not too crumbly, and with loads of delicious flavor in every bite. 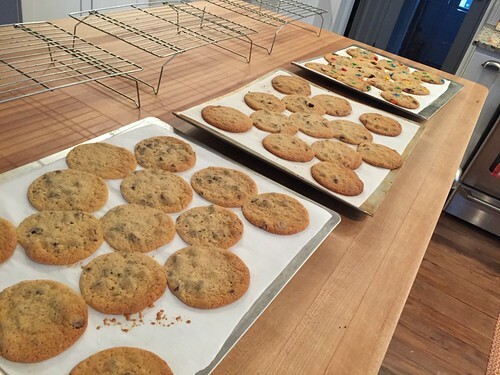 I’ve actually done quite a bit of reading and “research” about cookies… and after baking many, MANY chocolate chip cookies, I’ve feel like I’ve finally come up with a pretty darn good cookie recipes that my family is CRAZY about! I’ll share the recipe below — but first, I want to share a few things I learned about making these crispy on the outside, chewy on the inside, not too fluffy, not too crumbly cookies with delicious flavor! 1. Don’t use baking powder! In my opinion, there is definitely a place in this world for soft, fluffy cookies… just not for soft, fluffy CHOCOLATE CHIP cookies! If you prefer flat chocolate chip cookies (like I do) DO NOT use baking powder! Obviously, I know that baking powder makes cookies (and other baked goods) rise, but I figured the tiny amount called for in so many of the chocolate chip cookie recipes I looked at wouldn’t make THAT much of a difference — but it does! 2. Measure your flour by scooping it into the cup. When I bake, I often just dip the measuring cup straight into the flour bag without much precision, but apparently, that results in using too much flour because it gets packed down in the measuring cup. 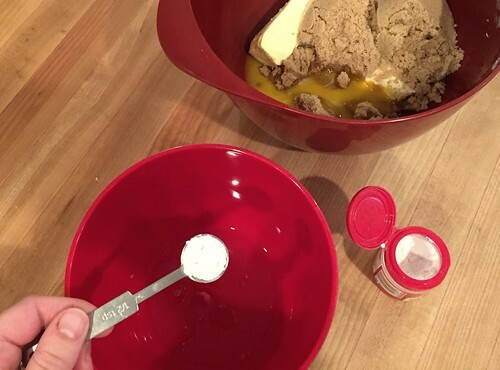 Now, when I make my chocolate chip cookies, I use a separate scoop to pick up the flour and then spoon it into the measuring cup. This means less flour, which means a crispier “crust” on the cookie. 3. Add in a bit of oat flour. Speaking of flour, I learned that adding a small amount of oat flour to the dry ingredients will help make denser cookies that aren’t so light and fluffy. Since I REALLY like dense chocolate chip cookies, I now add 2 – 3 Tbl. of oat flour to my batter. 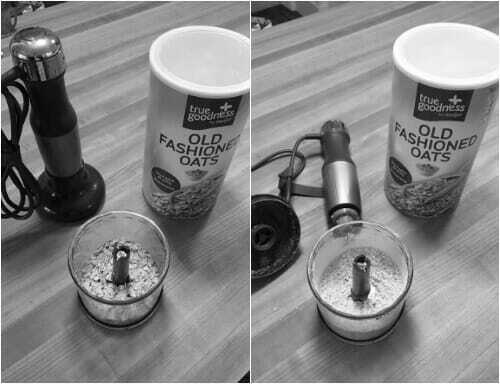 Oh, and oat flour is very easy to make — just grind quick oats or traditional oats in a food processor for 10-20 seconds! 4. Use room-temperature butter (or margarine). While you definitely don’t want to use melted butter, it’s also somewhat tricky to use hard butter right out of the refrigerator. I try to let my butter get to room-temperature before baking as it seems to mix in so much easier. If you want firmer dough, you can always use room temperature butter, and then put the whole bowl of dough into the fridge for 10 – 15 minutes before baking. Also, although we rarely use margarine for anything these days, I still use a mixture of half butter, half margarine for my chocolate chip cookies as I feel it really does change the taste and texture in a positive way. 5. Use more brown sugar than white sugar. So many of the cookie recipes I came across use equal parts brown sugar and white sugar — however, when I started using more brown sugar, my cookies tasted better. I am currently using around 1 c. brown sugar and 1/2 c. granulated sugar in my chocolate chip cookie recipe and really like that ratio. Oh, and I almost always use light brown sugar, but I’ve used dark before without a noticeable difference. 6. Bake the cookies on parchment paper. I first started using parchment paper because I only had 2 cookie sheets and I didn’t want to wash them in between batches of cookies. So I simply slid the one sheets of parchment paper off when the cookies were finished, and slid a new sheet on with new cookie dough. However, I soon realized that I liked the crispiness of my cookies when I used parchment paper — so now I always use it. I do have a couple of the reusable silicone baking mats (and I like using them) but for some reason, plain parchment paper makes really nice crispy cookies — and that’s how I like them! 7. 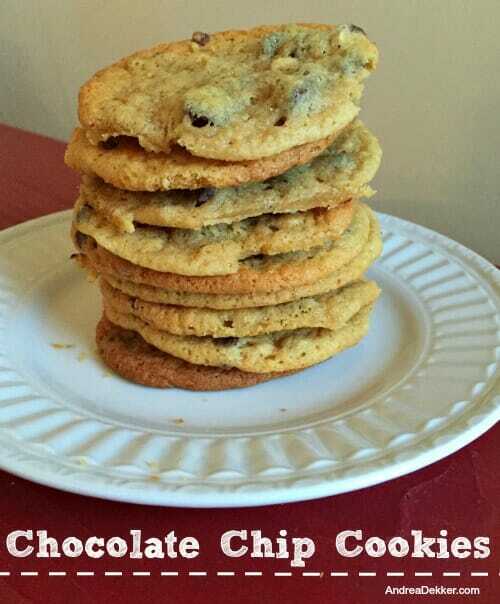 Use various sizes and types of chocolate chips. I know this might sound crazy, but I SWEAR chocolate chip cookies taste better when I use various sizes and types of chocolate chips. For example, I might use semi-sweet mini chocolate chips, milk chocolate regular chips, and dark chocolate chunks all in one cookie. This is such a simple way to really boost the chocolatey flavor and add a little extra “crunch”. 8. Separate the egg whites. A couple weeks ago, I shared a simple tip for lighter, fluffier quick bread — which was essentially to separate the egg whites from the yolks, whip the whites until they are very frothy, and then add the whites to the batter at the very end. This helps bring lots of air into the bread and make it very light. Well, apparently the same technique works for cookies! I personally don’t notice as big of a difference with the cookies as with the bread, but there are countless websites and foodies who swear by whipping the egg whites separately and adding them at the end. Many people also suggest adding 1/2 tsp. or so of Cream of Tartar when whipping the egg whites as this helps keep the cookies light and chewy. I’ve tried this a few times with fabulous results! Now, I want to mention once again that my tips above are strictly for chocolate chip cookies — I wouldn’t necessarily recommend the same tips for other cookies. 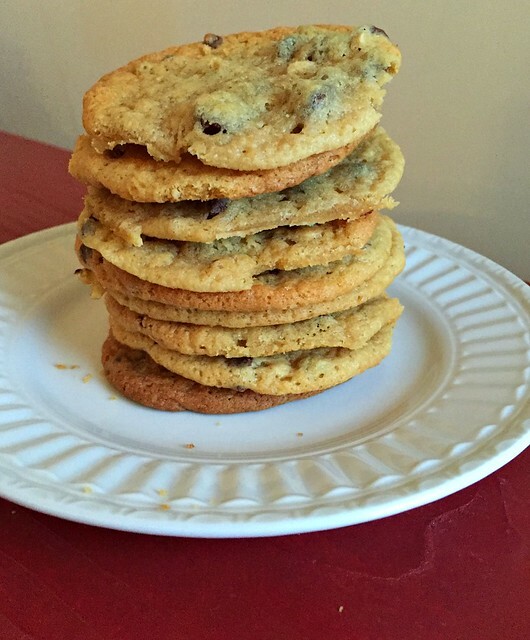 However, if you DO, then you might just want to try out my yummy chocolate chip cookie recipe ASAP! Crack egg whites into a small bowl and dump yolks into a medium bowl. Add Cream of Tartar to whites and beat with electric mixer until white and fluffy. Set aside. In the medium bowl, add both sugars, margarine, butter, and vanilla to the egg yolks. 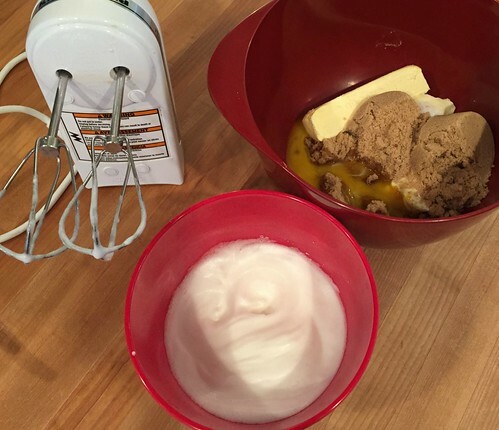 Cream mixture together until smooth. Add both flours, baking soda, and salt to batter and slowly mix until combined. Fold in egg whites with a spatula. This recipe has a couple of extra steps (which isn’t normal for most of my recipes) but the extra steps are not complicated at all, and the results are definitely worth it! 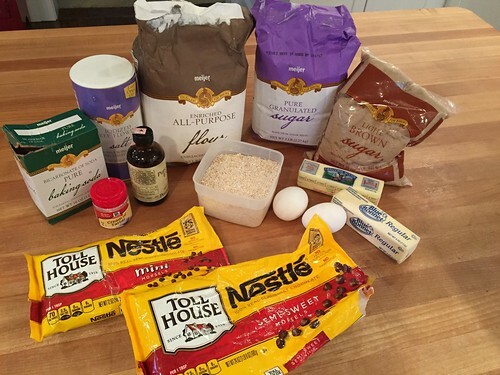 Do you have a tried and true chocolate chip cookie recipe? If so, share the link (or the full recipe) in the comments! 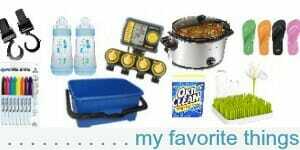 Also, be sure to visit my virtual recipe box for more simple, delicious, family friendly recipes! I just made these and they are SO close to my Grandmother’s recipe that I’ve been trying for years to duplicate. Thank you! I didn’t have Cream of Tartar on hand and they were still great. One question: does this gooey-er dough freeze well? I made a double batch and don’t need to bake all of them right now. yay — glad to help you find that recipe! As for freezing, I’ve successfully frozen just the dough, and also the already-baked cookies. So either should work! Thanks for another excuse to bake!! I have made your peanut butter cookies many times and loved them. Can’t wait to try these! Also, I love the title of your blog! I made these last night and they are great! Thanks so much for the recipe. My husband’s favorite chocolate chip cookie recipe that I have made is made with french vanilla pudding dry mix. Because of 2 of my littles having dairy allergies/intolerances, I haven’t made them in awhile. But, whenever I made and took them places, people always asked for the recipe. The original recipe called for dry vanilla mix, but I liked french vanilla better. And I think they were fluffy. For me, I prefer Subway’s chocolate chip cookie over any chocolate chip cookie I’ve ever had. When dairy is welcomed back in our house, I will have to try your recipe! My granddaughter is one of those peanut allergic kids responsible for all those stinking rules which I think are just plain dumb. But, regardless of whether or not I’m politically correct on the issue of peanut products being banned in school lunches bought and paid for by the parents, I have found a way around the issue. I have found a source (Amazon) for a chocolate chip that is made with pure cane sugar, no GMO ingredients or high fructose corn syrup. And on a day when I’m out of them, an ordinary semi sweet chocolate bar can be chopped into little pieces and used instead. Since peanuts are not really a nut, people who are allergic can often sub in nut butters. But you need to be careful because there can be cross contamination in processing so reading labels is important. 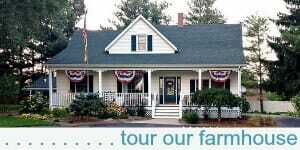 We have dealt with this for the past 15 years. Lots of “sub” sandwiches, made with deli sliced meats and cheeses, leftover home made pizza, egg, chicken and tuna salad sandwiches, homemade burritos and wraps, any leftover pieces of grilled chicken with leftover mac or potato salad, bags of cut veggies and apples, grapes, diced melon, whole strawberries, cherries in season, cuties (little tangerines that peel in a jiffy). 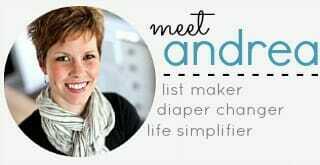 When my girls were little I was a full time student so we had no budget for chips, flavored milks or store bought cookies or sweetened yogurt, and my daughters constantly told me their classmates wanted me as their lunch packer! I have always relied on good fresh produce and had a weekly baking day. I just told them, when the cookies are gone there will not be any more for a week! I had to replenish the fruit bowl more often than weekly, because we ate fresh fruit at every meal, usually berries or bananas for breakfast, grapes or apples at lunch and often fruit salad with dinner, topped with a bit of sweetened sour cream. The leftovers were cycled into next day lunches. You can easily do this – I’ve never done differently and it save so much money if you don’t use expensive prepared products. I’ve even bought two or three big turkey breasts, roasted them and then sliced them with my slicer and frozen in 4 ounce packets. Ditto for beef roasts, pork tenderloins and other tender meat fo make sandwiches. It’s easy! Nora eat meat + cheese + crackers a lot, or just jelly and butter sandwiches. However, she only eats at school 2 days a week (sometimes only once) so I don’t have much experience yet! I ran into the same problem with this recipe…not allowed at school or church. However, the other day I substituted WOW butter for the peanut butter. Worked like a charm. My daughter, husband, and the guy I work with ( a picky eater, travels a lot, including to resorts, and is used to VERY delicious food), and none of them could taste the difference;). I will give these a try, but your other recipe has become our go to cookie recipe and I absolutely love them…..so much I can eat 10 in one sitting!! I know, the other peanut butter chocolate chip recipe is our favorite too! 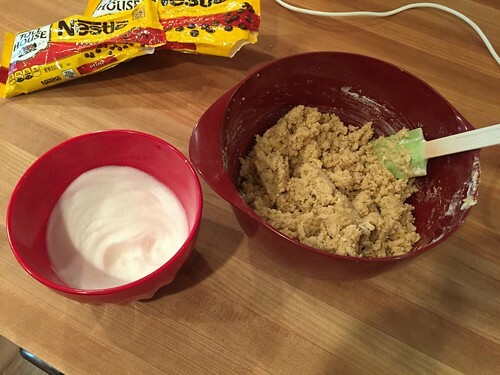 This is a totally different type of cookie though — so it’s a nice way to mix it up a bit! Have you had success freezing the dough for later use? Your monster cookies have become a staple in our house! Also, I just pulled Monster Cookies from the oven about 10 minutes ago! I learned in home ec class, you should always measure flour scooping it with a spoon. 🙂 I’m looking forward to trying your recipe. Hope you love the cookie! I love how everyone has their own favorite chocolate chip cookie recipe. I like mine thick and chewy and I almost always add lots of oatmeal. Yum! My coworker has their grandmas recipe and it’s really good and I think it uses a ton of shortening. Yes, Dave and I are “thin and crispy” chocolate chip cookie lovers! We LOVE LOVE LOVE the Subway cookies!! These cookies tastes a lot like those! I have found with most cookie recipes if I refrigerate for at least 3 hours or overnight the taste and texture are both greatly improved. I don’t know why that happens but it makes a difference. But I don’t do it very often. I don’t make plain chocolate chip cookies very often. It’s either peanut butter or oatmeal chocolate chip cookies, or the best, peanut butter oatmeal chocolate chip cookies! Yes, I sometimes refrigerate the dough if I’m planning ahead. Also, we too prefer peanut butter in all our cookies — but since Nora can’t bring those to school, I needed to find another, non-peanut butter recipe!